On October 18, 2018, there occurred worldwide the “One Million Children Praying the Rosary.” This prayer campaign came about in 2005 in Caracas, the capital of Venezuela. In the Philippines, thousands of children from around 1,200 parishes and 700 schools from 41 dioceses have joined the initiative. 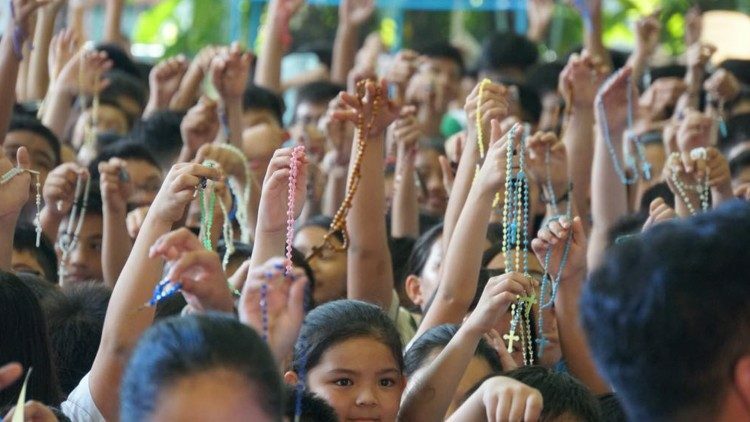 Now on its third year, more than 80 countries participated in this year’s “one million children Praying the rosary” for peace campaign of the international Catholic charity Aid to the Church in Need (ACN). Be sure to Sign up and Join with your Family, Parish and Friends for Next Year! Why the 18th of October? October is traditionally the month of the rosary; the 18th is the feast day of Saint Luke the Evangelist. Only God can bring peace. We can play a part in this—through our work, but first and foremost through our prayers. Materials for the prayer campaign are available in 25 languages, including, for example, Arabic and the West African Hausa language. Children from around 80 countries and on all continents are taking part.